I was invited to an event by Daub + Design which is a Vancouver based active wear brand to check out their collection and to test our own skills. I brought my friend and blogger Joy with me to take part in the fun. Daub + Design is very unique because every single item is its own design. Hand-dyed pieces made by the owner and designer, Lexi Soukoreff to make one of a kind pieces. She was nice enough to take us through the entire process of what she does for every piece. It's amazing the amount of work that goes into one item, which makes you realize and appreciate the effort that it takes just to make one piece yet alone hundreds more. We were also lucky enough to get to try making our own hand-dyed design. Daub + Design just launched a collaboration with Edit, an accessories brand by Joanne Maharaj Lewis also based out of Vancouver. After both Lexi and Joanne having their own brand for years and being friends, they always wanted to collaborate and finally decided too. This was such a great idea on their part, using the hand-dyed design of Daub + Design and using on clutches and bags made by Edit. 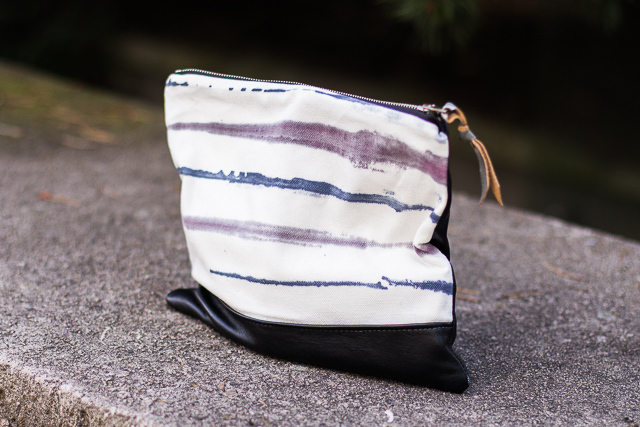 So we got to design our own hand-dyed clutch. I decided to do a batch dye (which means stripes...cause you all know I love stripes) instead of the Shibori (which we know as tie-dye). I also chose to keep my colors neutral, I went with black and gunmetal and a leather detail at the bottom and a silver zipper to finish it off. It is exciting to make our own design of something and to have to wait and see how it will turn out. This is the finished product (in the last photo) it turned out so cool. So unique, one of a kind piece that no one else has. Purchasing will be the next step I want to take with all sorts of stuff displayed in the blog, I appreciate the post. I feel that it is all fashion clothes and accessories as what you will want to get.